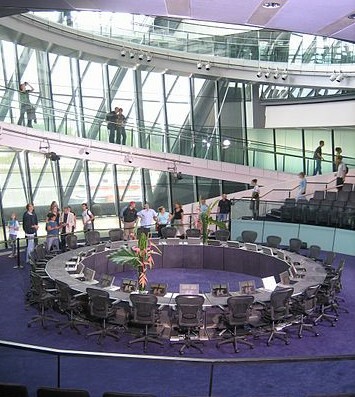 Don’t like our weighted figures for our London Assembly Prediction? Then try your own. Simply input the number of votes for each constituency and party list into the orange box and this will calculate the number of seats each party will win / be awarded in the Assembly. Let us know your feedback. This calculator uses two alternative methods for estimating how many of the 14 constituency seats are won by each party in the Assembly. The first method uses a uniform London-wide swing between the Conservatives and Labour based on all the constituency votes cast in 2008 vs all the constituency votes predicted this time. This method is useful if there are some constituencies where not enough polling data is reliable to give a reliable individual prediction. The second method calculates results on a simple constituency-by-constituency basis by picking the First Past the Post winner separately in each constituency – this is the method used in the actual election so would be more accurate with large numbers of respondents, but might be unreliable if the sample size in each constituency is low. Finally the results for the 11 top-up seats are calculated using the same modified d’Hondt method that is used in the real election, taking into account the number of list votes cast and the number of constituency seats already won by each party.